We were delighted to learn that former Willastonian Andrew Witty has been awarded a Knighthood for services to the economy and the UK pharmaceutical industry. Sir Andrew Witty was born in 1964. He lived in Willaston during his early childhood and was a pupil at Willaston Primary School. He later attended Malbank School, in Nantwich, where he met his future wife, Caroline. They now live in Buckinghamshire with their two children. After gaining a BA in Economics at Nottingham University, Andrew joined Glaxo UK as a management trainee and his subsequent career has been nothing short of meteoric. After a string of senior positions with GlaxoSmithKline, one of the largest companies in the world, he took over from Dr. Jean-Pierre Garnier as Chief Executive Officer in 2008. 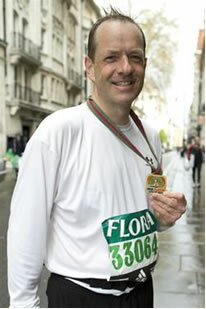 In the same year he ran the London Marathon (see picture) raising over £25,000 for a charity which provides activity camps for young people affected by serious illnesses. We would like to offer our congratulations to Sir Andrew and his family. It’s not everyday that a former resident of Willaston receives a Knighthood. In fact, we think Sir Andrew Witty may be the first person to do so. But Sir Andrew Witty wasn’t the only person with Willaston connections to be honoured by Her Majesty in the New Year Honours. One of our most successful businessmen, Clive Christian of Willaston Hall, received an OBE for services to the luxury goods industry. Most local people associate Clive Christian with high quality kitchen furniture, but he has another lucrative string to his bow. 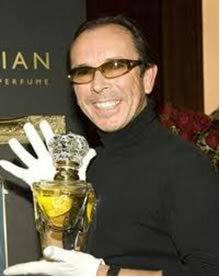 In 1999 he took the reins of The Crown Perfumery, one of Britain’s oldest perfume houses. The Crown Perfumery was first made famous in the 1870s when it was uniquely honoured by Queen Victoria with the gift of her crown as “a symbol of utmost quality and British excellence”. Clive has been successful in reviving the original values of the house by creating pure perfumes in complex formulas with the most precious natural ingredients. His perfumes, which are sold in many parts of the world, include the exclusive Imperial Majesty, part of the “Clive Christian No. 1” range. Retailing at £115,000 for a 500ml bottle, Imperial Majesty is now one of the most expensive perfumes in the world.